In other words, I don’t list my fees because I have any illusion that they’re “competitive,” and I don’t care whether they are or not. I certainly hope that NONE of my fees are anywhere near the low end for what I do (criminal, DUI and license restoration appeals). Instead, I list my fees because I think it’s the right thing to do. There is an entire science to how lawyers “quote” fees, but I have no interest in or patience for that kind of gamesmanship to try and rope in clients. Moreover, I find it repulsive that I could ever be on the receiving end of that kind of tactic if I was looking for help. Personally, I don’t mind paying more for better goods or services. However, I would be sick to learn that I hired person X for something, but got charged more than someone else for the exact same thing. One of the main reasons lawyers are reluctant to mention the cost is because they don’t want to scare off a potential client by coming in higher than someone else. For some people, hiring a lawyer is a lot like buying a car, where price is the biggest factor, there is a lot of comparison shopping, and maybe a call back to someone they like better in the hopes that a previous price can be matched, or beaten. Plenty of lawyers will “wheel and deal” in that way. Hiring a lawyer, however, is not like buying a car. I would hate the idea that if I wanted to hire a particular lawyer, he or she would increase or decrease the price based upon quotes I had obtained elsewhere. In other words, if lawyer X initially quoted me $3500 for my case, but then was willing to go to $3200 because I found another lawyer who would handle it for $3250, what does that say about him or her? Nothing good, except that maybe he or she would make a great car salesperson. Lawyer: Okay, in terms of your driver’s license, do you need to drive during work? In other words, do you go from place to place during your workday? What kind of work do you do? Potential: No, I work at XYZ corp., in the factory, so I’m in one place all day. Or, No, I’m a dentist, so once I’m at my office, I’m there for the day. Potential: Yes, I do, actually. I deliver pizzas. For the lawyer trying to “size up” someone’s ability to pay, you can be sure that the pizza guy probably won’t be quoted nearly as high as a fee as the factory worker or the dentist. Since my fees are published, the cost to hire me doesn’t vary. I don’t play games by sizing people up to see what I can get out of them, and I would certainly hate to be “played” like that myself. One potential benefit of listing my prices is that it can eliminate inquiries from people who can’t afford them. The last thing I want to do is waste anyone’s time, only to find out that he or she is looking for the lowest price. Notice that I characterize listing my prices as a “potential” benefit because despite the fact that they are listed on top of my site and this blog, plenty of people miss that. Thus, when somebody emails me and asks, “How much do you charge?”, I know that they don’t pay close attention, having missed the whole “Fees” section of my website (although the fact that I publish my fees is so unusual, most people would likely not think to look for that kind of information), and that also, they’re probably on the hunt for the best price. That certainly won’t be me. As I noted before, I’m not in competition with anyone, and certainly not on matters of price. I have NO interest in being among those lawyers whose best attribute is being the cheapest or offering payment plans, or anything like that. As I said before, that’s a race to the bottom, and there will always come a point when, in doing that, quality gets diluted and corners get cut to keep costs down. Whatever else, it has always been my goal to be the best at what I do, not the best value. I know exactly what it takes to properly handle DUI, driver’s license restoration and the kinds of criminal cases I do; so I can list a precise fee. 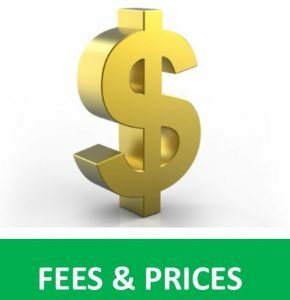 On my site, some fees are listed as “from” a certain amount, but my staff always provides an exact quote over the phone, before anyone ever comes in. Even in the most complex of cases, the actual price we charge is almost always very close to the “from” price. My fee in driver’s license restoration cases is nearer to the high end, but my service in this area is unequaled by anyone, AND it comes with a win guarantee. You can’t do better than that no matter what you pay. My fees in criminal and DUI cases are undoubtedly higher than most, but less than some. One of the most perplexing things to me is how so many lawyers quote fees way in excess of their abilities. For as many lawyers as there are who are desperate enough to “lowball” their prices, there are just as many who charge high fees for mediocre services. Paying too little means getting cheap service, but paying a lot doesn’t guarantee anything other than just forking over a lot of money. To find the best lawyer for anything, you should read what he or she has written. You should evaluate how a lawyer explains the things that are important to you. Does he or she seem patient? Friendly? Arrogant? Reviews are all well and fine, but how a lawyer breaks things down in his or her own words is the best way to learn what he or she is really like. My fees always reflect what I think is fair for the time we’re likely to invest in a case. Some lawyers, for example, charge a really high fee in criminal and DUI cases that covers a trial, unlikely as actually having one may be. In the real world, 99.9% of all criminal and OWI charges (at least in the kinds of matters I handle) DON’T go to trial, so my listed fees don’t include that. Why pay for something that’s not going to happen? If someone is price shopping, then they can see my fee and know where I stand. Whatever else, I’m transparent. No matter how appealing a lawyer’s marketing message may be, if he or she is secretive about price, then it’s unlikely he or she is anywhere near as open as I am about other things, as well. The whole issue of listing my fees is really part of the larger picture about how my office is different. For example, all of my consultations are done over the phone. I could never imagine dragging someone into my office for an appointment to do that. In an upcoming article, we’ll review the whole subject of consultations, and take an honest look at how they are used as an opportunity to get someone into the “client chair” in order to, as the saying goes, hook ‘em and book ‘em. I don’t do that. Again, I think of how much I would hate to be played that way, and I cannot imagine doing that to anyone else. I’m open and honest and upfront. A colleague of mine jokes that being honest has cost him a fortune over the years, and there probably is a lot of truth to that, but I wouldn’t have it any other way, either as the consumer, or the guy providing the services. If you’re looking around for a lawyer to handle a criminal or DUI case, or you want to hire a lawyer to win back your driver’s license, be a good consumer. Take your time and read around. If you want to know what something costs, then ask. At least with me, you can get that information online. When you’re ready to learn more, start calling around. All of my consultations are confidential and done right over the phone, whenever you give us a ring. My team and I are really friendly people who will be glad to answer your questions and explain things. We can be reached Monday through Friday, from 8:30 a.m. until 5:00 p.m., at 586-465-1980 (EST). We’re here to help.